Just wanted to inform you that our recent cd release of 'None of This Was Ever Real' is available at some very kind record shops around the Metro Detroit area. You can find them at stormy records, Dearborn Music, UHF, FOUND SOUND, Street Corner Music, and Lo & Behold! Records & Books. We highly recommend you to shop at these fine establishments, they are owned and operated by some great folks! 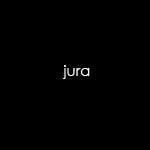 Jura's first studio album in five years now available.